It’s harvest-time, which reminds me that I had no idea what threshing grain involved until I moved to the Midwest in 1982. Old World Wisconsin showed the evolution of threshing technology at its three restored German farms, from hand tools to horse-powered machines to the mighty steam engines that powered an enormous threshing machine. Last fall my friend Marty sent me photo below, which had surfaced in some old files. 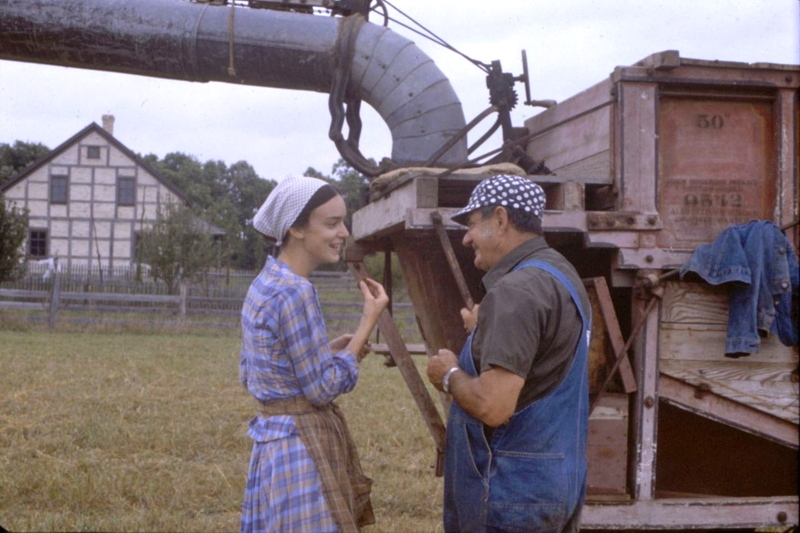 That’s me talking with one of the visiting crew, with the Koepsell Farmhouse visible in the background, in 1983. 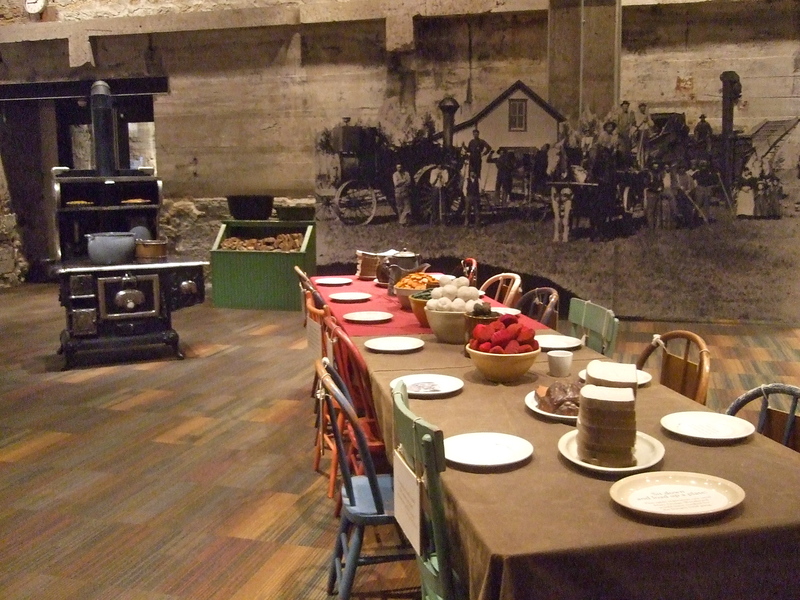 When I visited the Mill City Museum in Minneapolis, MN, I was again reminded of threshing days. The museum is wonderfully tucked within the ruins of an old flour mill. Many of the exhibits focus on the technology of milling. It’s difficult to present industrial history at an historic site, but the Minnesota Historical Society has done an amazing job of engaging guests in creative ways. Good interpretation helps visitors make connections. In the context of a flour mill, that meant educators and exhibit designers had to find a way to help people consider not just the mill workers, or even the farmers who raised the grain, but the women who baked with it. Those things had been tangible at Old World Wisconsin. I was curious to see how an indoor museum, without fields of grain and threshing machines and working farm kitchens, would present those concepts. As it turned out, quite well! 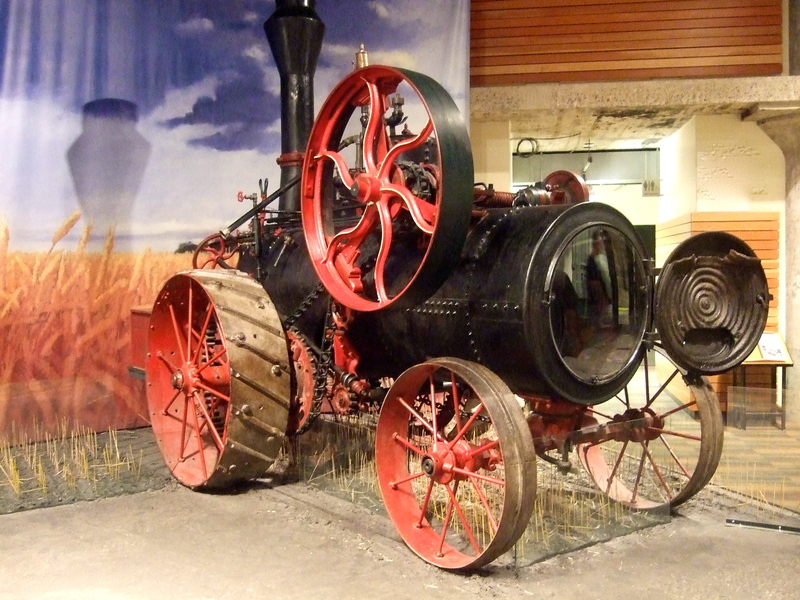 A steam engine stands in one corner of the main exhibit floor, near a life-sized photograph of a threshing crew. A cast-iron cookstove sits nearby, with pans of (faux) food waiting for kids to put in the oven. 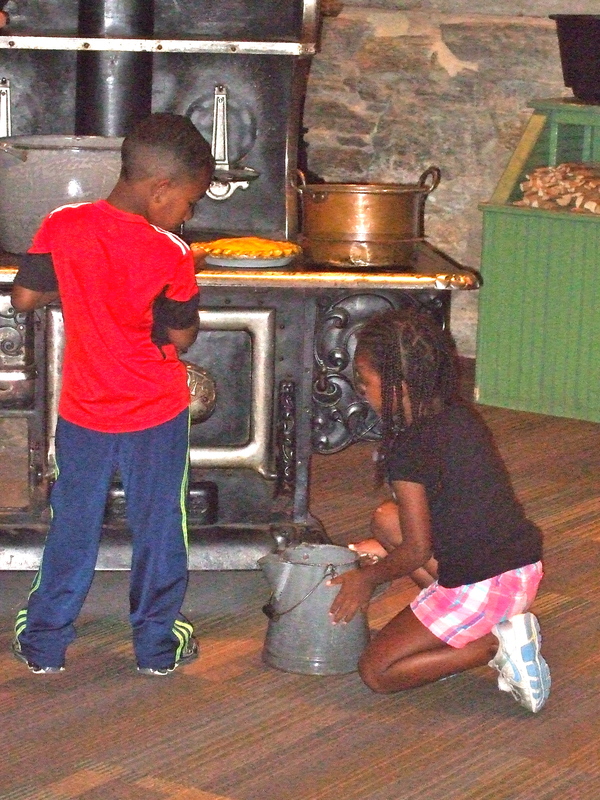 These kids got into the spirit by pretending to cook for the threshing crew. A long table is set for a threshing dinner. Hanging on each chair is a card with a short quote from a man involved with harvest work. And sitting on each plate is a quote from the diary of Mary Dodge Woodward, a widow who moved from Wisconsin to a 1,500-acre “bonanza farm” about 8 miles SW of Fargo in the Dakota Territory in 1882. Mary Dodge Woodward, 1880s; from Dodge Genealogy, 1904. An interpreter portraying Mary Dodge Woodward helped guests understand the enormity of the task facing women who cooked for enormous threshing gangs. When the Northern Pacific Railroad was being built, politicians wanted settlement along those tracks, and huge tracts of land were claimed in the name of progress. But when the railroad didn’t pay the dividends some investors had expected, the government stepped in and made huge parcels available—with the promise that all absent landlords needed to do was hire a manager and crew, grow wheat, and reap the financial rewards. The first of these bonanza farms were established in the Red River Valley in the Dakota Territory and Minnesota. When I talk with kids about historical research, I encourage them to approach their topic from as many different directions as possible. It’s a lesson I learn over and over again. While those years hearing and smelling and tasting and watching threshing time at Old World Wisconsin made an indelible impression on me, visiting the Mill City Museum gave me a whole new appreciation of women’s work when the threshing gang arrived.